I don’t go to our farmer’s markets as much as I’d like, but when I do, I always seem to find something new to try. 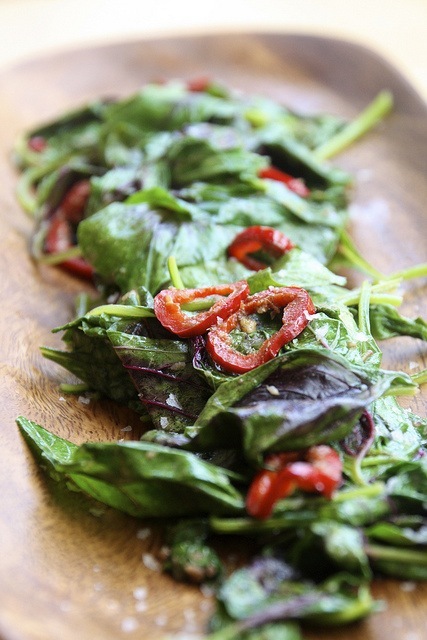 I enjoy dark, green leafy veggies quite a bit, so I’m not a hard sell. One vendor recently noticed me admiring the beautiful magenta color at the center of the larger deep, green leaves lightly filling a bag. “It’s red amaranth,” the young man told me, reaching for the bag I was focused on. “Here, taste it.” And so I did. 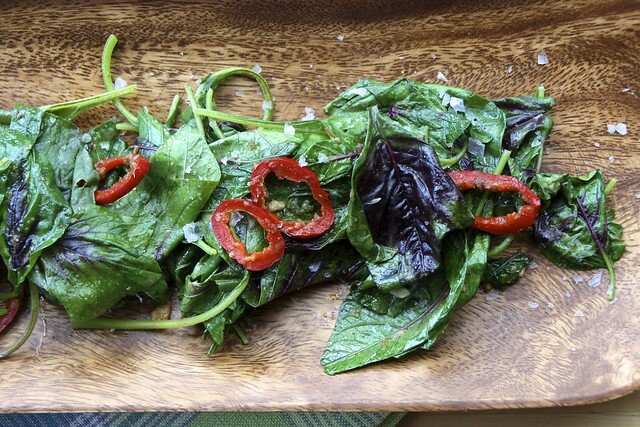 Although somewhat like spinach in flavor, amaranth, or what some refer to as Chinese spinach, is more sturdy between my teeth as I chew on it, its flavor somewhat like fresh grass smells like if that makes any sense at all. It’s not sweet, but not pungent, either, and leaves a pleasant, unbitter taste in my mouth. But I thought amaranth was a grain — isn’t it? And don’t I remember seeing annuals at the nursery with colorful plumes which also somehow reminded me of the tasty greens I was chewing on? Evidently yes to all above — sort of. It isn’t a true grain, but is referred to as a pseudo-grain. 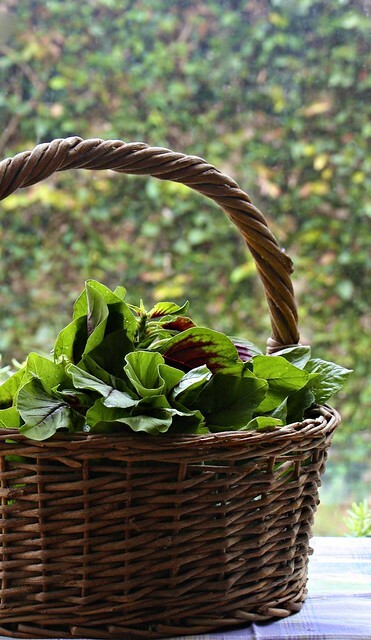 Some varieties are cultivated for the leafy green vegetable, some for seeds to be used much like rice or corn are used. And although I did know that buckwheat and quinoa were very high plant protein sources, amaranth seeds are as well. And, they lack gluten, so that makes them quite beneficial to those who are gluten intolerant. 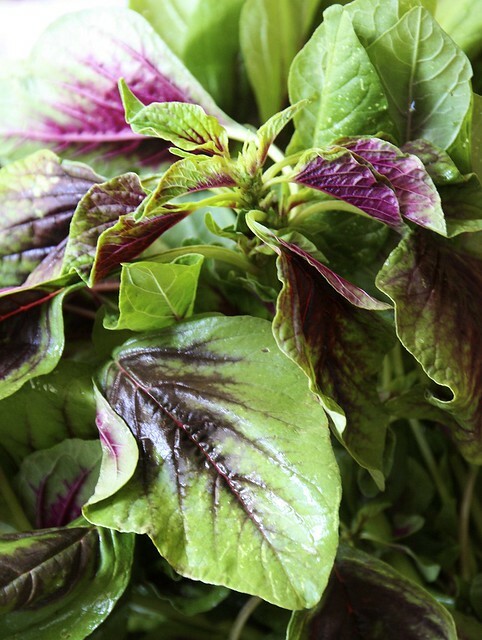 Historically, amaranth was a staple of ancient Mesoamericans and has been enjoyed in Asia for centuries. Why and how did our culture adapt to eating iceberg lettuce instead? Evidently, amaranth became associated with religious rituals involving human sacrifice, so it was banned by the invading Spaniards who then came to North America. So that explains how we ended up with ice berg lettuce. This recipe spices things up a bit, perfect for lunch by itself or a dinner side. 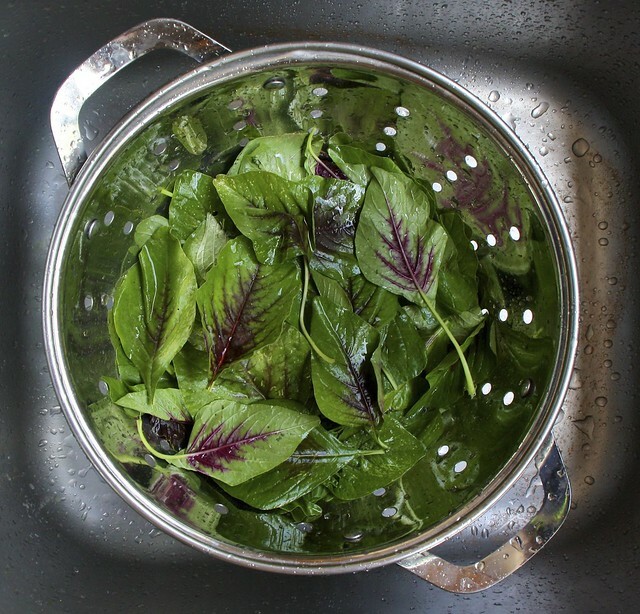 Use spinach if you can’t find red amaranth. Your body will thank you. Make sure the amaranth is rinsed of soil and thick stems are removed. Mix the dry spices together except the salt and set aside. In a large skillet or wok, heat the oil over medium heat and add the garlic, jalapeno, and ginger, stirring about 30 seconds or so to soften. Sprinkle in the mixed dry spices and stir lightly. Add the amaranth, stirring to mix with the other ingredients, then add the lime juice and a couple of tablespoons of water. Continue to toss lightly. I could make an entire meal of this, so if you plan to experiment, I’d start right away by doubling the recipe — at least! Soy sauce seems to belong in this — maybe next time. And maybe a bit of sesame oil. It would be perfect with a bowl of rice, or quinoa. Now I’m wondering about soup. I love a nice green soup.